Celebrate your sun sign and its starry symbol with Amy Waltz's personalized bracelet. Some say your character is written in the stars. When it comes to your style, we say it's all in the wrist. 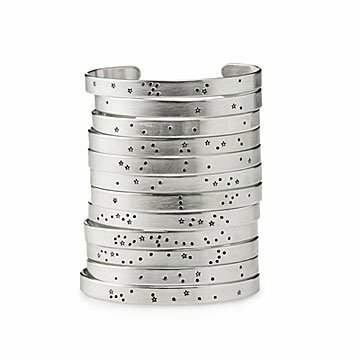 Celebrate your sign of the Zodiac with one of Amy Waltz's bands of sterling silver customized with that sign's constellation. She hand casts her celestial connect-the-dots in the cuff, with the brightest point of each shown as larger, five-pointed stars. Beautifully packaged with a card describing your special constellation, it makes an elegant personalized gift for lovely Libras, stylish Virgos, and all 12 sun signs. One size fits most. Squeeze gently to fit your wrist. Handmade in Chico, California. Gently polish with a clean, soft cloth. Wear this every day , all day. Beautiful silver cuff, not too large. I have purchased four of these over the year or so and just love them. Gave my daughter hers tonight for her birthday and she loved it too. Nice packaging with information card. Love that it is meaningful but unique that my sister can wear everyday. Fits easily and looks stylish. Intriguing design as each sign is different arrangement of stars. Reasonably priced and good quality. Lovely packaging as well. The best thing about the product is it's uniqueness and quality. This bracelet is a simple but unique accessory that is suitable for a wide range of occasions. Its versatility is much appreciated.